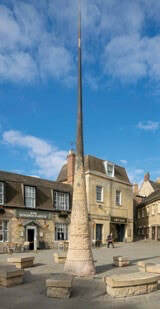 In the 2002 Newsletter John Plumb, the Chairman of the Civic Society, describes meeting a visitor from the Civic Trust at the Railway Station and walking from there to the centre of Stamford, recounting their experiences. In the light of developments that have taken place since (the controversial Gateway Project for example) it is worth re-visiting this article and commenting on what these experiences were. Arriving at the top of Castle Dyke they found that they were being actively discouraged from crossing the road: “no obvious place to cross” and “cars coming at you in all directions….” This is now addressed by the pedestrian crossing, although this is more accessible if coming from the bus station. They then proceeded to Sheepmarket where they found it “full of parked cars on loose or missing cobbles….” with “signage not clear as to whether to proceed towards a lane by the Post Office van storage or try to the right up Castle Street”. This would seem to be one area that has been improved considerably – Sheepmarket is now (mostly) car and van free and a pleasant entry to the town although signage is still very limited. They then commented on Horseshoe Lane through visitors’ eyes: “surely not….the way to see England’s finest stone town?” Arriving in Red Lion Square: “more parked cars, cars coming at you in many directions – whatever happened to the idea of public squares attractively laid out now seen in many towns?” While Horseshoe Lane still leaves much to be desired the issue of Red Lion Square has been addressed and although not perfect it is much better than as described here. The main problem was seen as the pedestrian route into the town and this, it was argued, could be addressed “by the reclamation as public spaces of both Red Lion Square and Sheepmarket”. To a great extent this is what the Gateway Project successfully achieved.